For high school juniors and their families, if it’s spring break, it’s most likely college tour time. 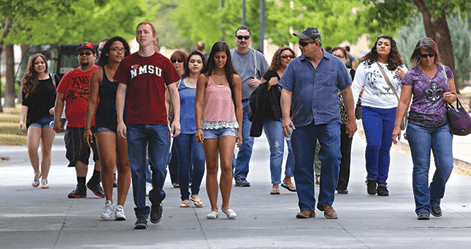 Junior year is usually a busy time as students and their parents plan college visits. Seeing a school can help narrow a student’s top choices and ultimately, provide information that will prove helpful when completing applications and essays. But what you do while visiting a school is equally important. #1 It may seem obvious but phone/check out the web site first. Some schools require prospective applicants to reserve a spot in the information session and tour. Since information sessions and tour times vary seasonally, confirming the time will prevent mix-ups. While you have them on the phone, make sure you are on the school’s mailing list and find out about the other resources available to prospective students. #2 Listen for key words. Whenever representatives from the school talk, especially at information sessions, listen to the words they use. Most likely, you’ll be able to pick up on what’s most important for that school. Then compare the words you heard most often and see if they are also used in marketing materials and on the admission’s section of the college’s website. You’ll be amazed how easy it is to find the key words or phrases that schools emphasize over and over again. Write these words down and encourage your student to use them when writing application essays for the school, especially the “Why this school” essay. Putting together a school list is difficult, especially if all of the schools are running together in your mind. If your student won’t take notes, you should. Especially those are not affiliated with the admissions office. Student tour guides are sometimes less than forthcoming with respect to a school’s shortcomings. Other students, those who do not work for the admissions office, may offer different (and less scripted) insights. #5 Pick up the school newspaper and skim it. Hopefully, you took clear, meaningful notes while sitting in the information session and taking the tour. All too often things were clear when you visited, but later everything is a blur. School newspapers differentiate the school and highlight issues students and the administration consider important. It is a great way to get a sense of the campus. While on tour, be observant. Is the campus well cared for? That can be an indication of whether alumni give money to the school. Alumni who have had a great experience and feel that their school was part of their success often give back. #7 Attend the information session. Other than an interview, this is the closest most applicants get to the admissions committee. Take advantage of it. Ask thoughtful questions during, or better yet after, the information session. Get the speaker’s card and follow up with an email or note The note will not get you in, but it will likely be included in your application and provides another data point on which your application will be evaluated. Even if it is not required. Interviewing showcases an important component of your application: interpersonal skills. These are difficult to demonstrate in an essay. If possible, interview with an admissions counselor on campus versus an alumnus. It will be, after all, a member of the admissions committee who will be evaluating your application. #9 Try an overnight stay. Sometimes the best way to get a sense of how you would fit in on campus is by staying overnight. Unlike anything else, it gives you a chance to experience a college’s classes, dorm life, campus safety, cafeteria food, and social life up close…blemishes and all. #10 Investigate the campus’s crime statistics and those of the surrounding neighborhood. Campus safety is important. Students need to feel safe when walking back from late-night study sessions or socializing. If the prospective student neglects to do that research, a parent should. Knowing the campus is safe will make everyone more comfortable. Stephanie Klein Wassink, is the founder and principal of AdmissionsCheckup.com, http://www.admissionscheckup.com. She is also a Fairfield County-based college consultant for more than 15 years, For more information email [email protected].